I know, it all sounds so confusing but this ruler is an extremely versatile tool which simplifies paper piecing. It helps save you time and gets you away from the slow process of using a template to cut one piece of pattern at a time. Now the name is something else. Where in this world did they come up with this trademark? Well it is an interesting story that started in 1995 and going strong today but you will need to ask them to explain when you order your ruler. Foundation Piecing is the traditional name quilters associate with this technique. There are a few methods of foundation piecing and the most common is called paper piecing. Another name is string piecing or freehand foundation piecing. Flip and sew and sew and flip are two more descriptions associated with foundation piecing. Don't confuse English paper piecing with foundation as that's a totally different technique. All this name-calling is a bit confusing especially for beginner quilters. Foundation piecing had a dramatic rebirth in the 90's when Add A Quarter ruler was introduced by CM Designs, Inc.
One thing for sure, it's more difficult to describe foundation piecing then it is to actually do it. With the Add-A-Quarter ruler you will find it to be the easiest techniques you've ever tried. 18" Add A Quarter quilting ruler is used for larger projects. 12" Add A Quarter quilting ruler is used for medium projects. 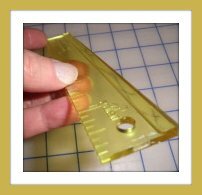 6" Add A Quarter quilting ruler is used for smaller projects. Add An Eighth quilting ruler is used for miniature projects. Add-Three-Eights quilting ruler is used for flannel fabrics. The Add A Quarter combines the speed of rotary cutting quilt pieces with the accuracy of using templates. The Add A Quarter will automatically add the customary 1/4" seam allowance to any straight angle and provide a straight edge for your rotary cutter. The width of the rulers are not very wide and at first it takes some getting use to. When using the rotary cutter your fingers are close to the action. Be careful! In the late 90's I took a class to learn how to paper piece. At that time I was introduced to the Add A Quarter quilting tool and fell in love all over again. When I was doing my research on this product I was elated that all of the above items are now available and I ordered one of each. I plan to do the miniature projects I purchased several years ago using the Add-An-Eighth. As they say, these rulers are standard “must have” tools for everyone wanting to learn to paper piece. You use their Add-An-Eighth ruler for miniature paper piecing designs or Add-Three-Eighths ruler for flannel fabrics. They also came up with a template called Add-Enough to help you figure how big to cut fabric pieces when paper piecing. The Add-A-Quarter is an extremely versatile tool which simplifies paper piecing and helps save you time and gets you away from the slow process of using a template to cut one piece of pattern at a time. Click To Get Your hands On The Add A Quarter Ruler!